Soft Tissue | Powell Chiropractic Clinic, Inc.
Every session is a catered to the need and specific condition of each patient. Interest in instruments to extend the “reach” of chiropractors, massage therapists, and others got a boost in the ’80s when David Graston suffered a debilitating sports injury. Graston’s disappointment with the rehabilitation methods of the day caused him to create several stainless steel instruments with various shapes and angled surfaces. These instruments were designed to augment hands-only approaches to healing and result in more effective results. Fingers alone cannot detect restrictions at deeper levels, nor can they match the ability of the right instruments to treat the full range of restrictions. Our office utilizes the state-of-the-art methods of instrument-assisted soft-tissue mobilization (IASTM) to help patients recover quicker and more completely. Which parts of the body can develop soft-tissue injuries? Soft-tissue injuries, such as strains and sprains, often affect the extremities—the legs or arms, in addition to areas around the spine. A soft-tissue injury can occur anywhere that ligaments, tendons, muscles, or myofascia are found. Ligaments connect two or more bones and help stabilize the joints. Tendons attach muscles to bones. Ligaments, tendons, and muscles provide a natural brace to protect the bony skeleton from injury. 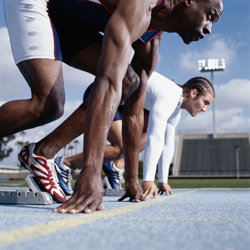 A ligament can be injured, for example, by making a movement that would take a joint outside of its normal range. 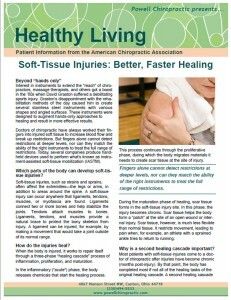 Soft tissues, in general, can be injured from a trauma or from repetitive movements. After an injury, whether a one-time occurrence or form multiple smaller events, the are will heal, and scar tissue can form. The presence of scar tissue can result in abnormal motor patterns and pain syndromes. To treat soft tissue conditions, our doctors utilize hands-on techniques including active and passive myofascial release, Rapid Release Technique, and specific IASTM techniques using instruments and an emolient (lotion) to gently glide over the skin. Using different motions and pressures, the doctor moves the instrument around to locate restrictions. Treatment breaks down scar tissue and encourages the body to heal the underlying tissue. As the scar tissue decreases, functional rehabilitation for the affected areas are most commonly utilized to improve dysfunction and prevent relapses. Your doctor will review your case and evaluate your neuromusculoskeletal system. If dysfunctions or imbalances are detected which manual therapies can benefit, you may be recommended to have soft tissue techniques added to your care. The ultimate goal is help your body reduce pain and improve function, naturally. Most of these conditions share two important common denominators: overused muscles and imbalanced muscle systems. We use soft tissue techniques in addition to adjustments and rehabilitative therapy to help many muscle-related conditions resolve quickly and effectively.